Laboratory head, Department of Anatomy and Developmental Biology, Monash University, Melbourne. 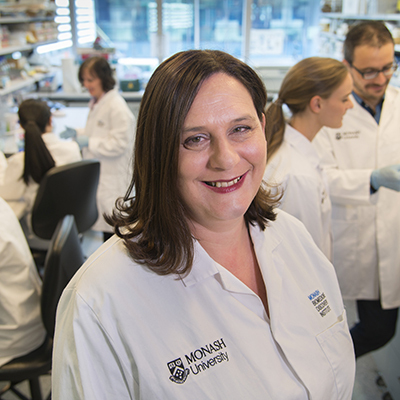 Associate Professor Helen Abud studies the delicate balancing act that goes on in our intestine, where stem cells help replace our intestinal lining every few days. Overactive stem cells here can lead to bowel cancer and underactive cells to a loss of intestinal lining. Helen is trying to stop these cells causing damage and use them to repair it. Her laboratory team is growing organoid or “mini gut” cultures from tissue from bowel tumours and using this culture method to test the response of different individual tumours to drugs. Helen is also trying to understand if a patient’s stem cells could repair an intestine by either stimulating them to regenerate more efficiently in the body or by taking tissue samples to increase their number in culture before returning them.